Honoring and remembering Private Bailey David Massingill of Company L, The Chestatee Artillery, from Raburn County, Georgia. Enlisted as a Private 11/1/1861. Roll dated 9/15/1864, last on file, shows him sick, in hospital since 5/22/1864. Born in Raburn Co., Ga., in 1840. After the war he married the widow of Issac Newton Owens, another soldier from the same outfit who didn’t make it back. Filed a CSA pension application in 1910 in Floyd Co. Ga., stated he was present at the surrender at Appomattox Court House on 4/9/1865. 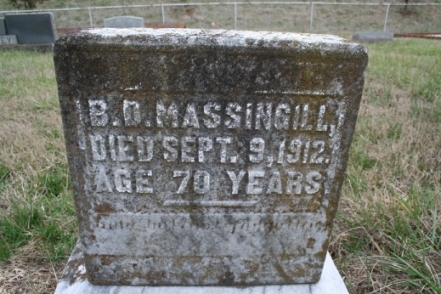 Buried at Salmon Cemetery, Floyd Co., Ga. Died 9/12/1912, at age 70 according to grave marker.